Deluxe log cabins are designed with a western flair that add character and ambiance to reflect the quiet peace of the old west. Each cabin is nestled in the natural beauty of the forest pines. 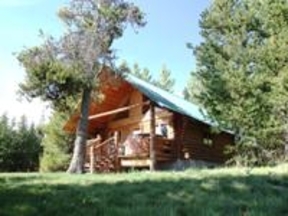 All include a kitchenette and for your enjoyment and relaxation, some cabins even have a private hot tub. The ranch also provides other activities for their guests including horseback riding, canoeing, and fishing on their private water.